Roobina Karode is the Director and Chief Curator at the Kiran Nadar Museum of Art, the first private modern and contemporary art museum in India. Since its inception in 2010, she has curated several acclaimed exhibitions at KNMA. Karode curated 'Open Doors' at the launch of KNMA Noida in 2010 and 'Time Unfolded' at the opening of KNMA Saket in 2011. Focused on expanding the audience-base and connecting the general public with urban art practices, Karode expresses, "KNMA is premised on the belief that art museums today are not merely repositories of art objects or sites of display, but can be mobilized as spaces for dialogue and sustained interaction." Karode specializes in Art History and in Education and has been involved with the teaching of Western and Indian Art History (1990-2006) at various institutions, mainly The School of Art & Aesthetics, Jawaharlal Nehru University, The National Museum Institute, College of Art and the Jamia Millia Islamia University in New Delhi. Karode was awarded the Fulbright Fellowship in 2000 and was placed as a Visiting Scholar at Mills College in California, where she curated Resonance, an exhibition on California Painters and Sculptors from the Mills College Art Collection. 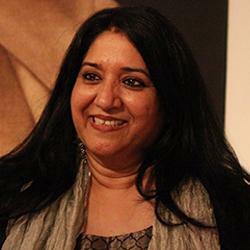 As a critic, she continues to contribute thematic essays and reviews to art journals and the Art India Magazine. She has written extensive monographs on contemporary Indian artists across generations and for cross-cultural collaborations. Karode co-curated a seminal exhibition titled 'Tiger by the Tail! Women Artists of India Transforming Culture' in 2008, showcasing contemporary art by seventeen women artists of India at the Women’s Studies Research Center, Brandeis University, USA. She has also curated a major retrospective exhibition on the internationally acclaimed US based artist-printmaker Krishna Reddy at the IGNCA, New Delhi.